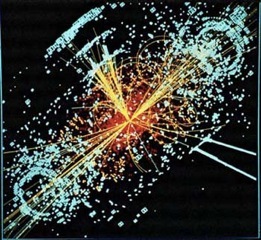 The Higgs boson is a “fundamental” particle; one of the basic building blocks of the Universe. It is also the last missing piece in the leading theory of particle physics – known as the Standard Model – which describes how particles and forces interact. The Higgs explains why other particles have mass. As the Universe cooled after the Big Bang, an invisible force known as the Higgs field formed together with its associated boson particle. It is this field (and not the boson) that imparts mass to the fundamental particles that make up atoms. Without it, these particles would zip through the cosmos at the speed of light. If our ideas about the Higgs boson turn out to be correct, then everything we see is a kind of window dressing based on an underlying fabric of reality in which we shouldn’t exist. The particles that make us up – which bind together to form protons, neutrons, nuclei and ultimately atoms – have mass. Without the Higgs, these particles would be massless, like photons. As successful as the Standard Model has been, it still doesn’t encompass gravity. Nor does it provide a reason for why there was an excess of matter over anti-matter after the Big Bang, allowing the Universe to come into being. And the theory accounts for the behaviour of just 4% of the Universe – its normal matter. The rest, in the form of dark matter and dark energy, remains to be explained.